Did you know that there’s a Cookie Diet? Yes, unfortunately, there is, and it’s based on the premise that if you exchange some of your meals for low-fat cookies, you’ll lose weight. Sounds about as sensible as the latest Ketogenic Diet fad, promoting over-eating fats, or the once-popular Grapefruit and Cabbage Soup diets. Look up “diets” in Wikipedia, and you’ll find over 90 different diets listed with links to every single one. When researchers at UCLA analyzed 31 long-term diet studies, they found that a majority of participants regained all the weight, plus more. At one time, I was just like all those other people, looking for the perfect diet that would allow me to lose weight in record time, dropping 10 pounds only to gain 15 in the months to come. Then, one transformative day, I decided to leave the diets behind and chose to eat whole foods as nature intended. It was a journey I took with my entire family and prompted by my son who was in and out of hospitals since his birth. In the process, my son regained his health, and I lost 70 pounds. I have maintained my ideal weight of 135 without “dieting” ever since. So, what does this story have to do with alkaline water? Some might suggest that alkaline water for weight loss is yet another diet to be listed in Wikipedia. I disagree. Alkaline water for weight loss combines two of the most important ingredients for sustaining and creating health—alkalinity and water. Let’s take a look at the first topic—alkalinity—and how it relates to our health. When my family and I changed our diet to one based on whole foods, guess what happened? We stopped eating the many foods associated with the Standard American Diet that causes acidity in the body, and more of the foods that create an alkaline environment, such as fresh fruits and vegetables. Did you know that everything you eat leaves a metabolic “ash” in your body? This residue occurs because the body actually burns the food you eat as it extracts the energy or calories it requires in much the same way that wood is burned for fuel in a fire pit–a process called oxidation. And, just as burning wood leaves behind ash, so, too, does food. The ash left behind is either acidic or alkaline. Foods that leave an acid ash includes all meats, dairy, most grains, eggs, coffee, sodas, alcohol and sugar. Alkaline-producing foods include fruits, vegetables, ancient grains such as quinoa and kamut, beans, and some nuts and seeds. What is an alkaline environment? All living things must maintain a certain pH level in order to survive. 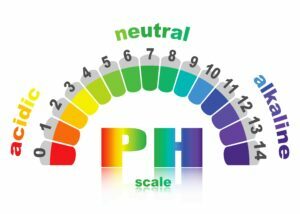 pH is the measurement of the hydrogen ion concentration and ranges from 0 to 14 with 0 representing very acidic, 7 indicating a neutral environment, and 14 referring to extreme alkaline environments. Humans require a blood pH level within the 7.3 to 7.4 range—a very tight margin that the body goes to extraordinary measures to maintain. When our bodies are continually bombarded by acid producing factors, from the food we eat, to environmental toxins, to the thoughts we repeatedly think, buffer systems start the process of neutralizing these excessive acids in order to keep us alive. Alkaline Minerals: Sodium, potassium, calcium and magnesium are the alkaline minerals stored in the tissues of the body that bind with acids in order to neutralize them, and eventually eliminate them from the body through the kidneys, lungs, colon, and skin. If the tissues are lacking these essential nutrients, the body finds them and extracts them from other areas, such as the bones and muscles. Fun Fact: You would think that a lemon would be classified as an acidic food…yes? However, because it is high in calcium, magnesium and potassium, the metabolic ash it leaves behind is actually alkaline. If you’re not moving much, or don’t use a dry skin brush regularly, your lymphatic system is stagnant and acids build up. Fat Buffer System: Low-density lipoproteins, commonly referred to as LDLs, bind with acids found in the blood, lymphatic system, and tissues of the body which are then removed via the urine. If the body becomes overloaded with acids and the buffering systems are unable to keep up with the load, the body will protect the vital organs by storing these fat-acid combos in areas such as the hips, thighs, and stomach—eventually creating obesity. If under constant threat of acidosis–a condition in which the body tissues become increasingly acidic–the ability of the body’s buffer systems to maintain an alkaline environment diminishes, and the chances of developing chronic diseases such as metabolic syndrome increases. This syndrome is linked to acidosis. Symptoms associated with this disease include not only clinical obesity, but also high blood cholesterol, low amounts of HDL (the “good guy” in cholesterol circles), high blood pressure, kidney stones, and high blood sugar. It is also a predictor for cardiovascular disease and type 2 diabetes. We now understand the importance of an alkaline environment, so what does water have to do with it? Water, as you know, is life sustaining. Without it, we will die in about four days. 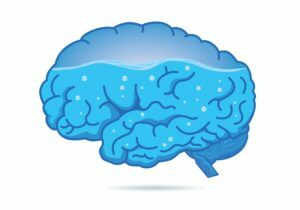 Our brain is comprised of more water than any other substance. In fact, almost 75 to 85 percent of it is water and it uses this liquid to create hormones and neurotransmitters. What else does water do for us? It regulates our temperature, acts as a shock absorber for the brain and spinal cord, lubricates joints, removes waste, helps deliver oxygen to every part of our body, and allows the cells to grow, reproduce and survive.6 Pretty important stuff. When we don’t drink enough, we suffer from fatigue, dizziness, brain fog, muscle cramps, mood swings, constipation, dry skin, and insomnia. Not only does lack of water affect our health, it also affects our weight. Think of the camel—with its one to two humps that it uses to store water as it migrates through the dry deserts. Your body does the same thing—when it does not receive sufficient amounts of water, it stores it…i.e. water retention. Often, if you are dehydrated, what you feel as hunger is actually your body telling you that you are thirsty. Try drinking a glass of water next time you feel that you need a snack. You may be surprised to find out you weren’t really hungry after all! So, now we are back to our original equation: Alkaline + Water = Health. We now know the benefits of alkaline foods and water. Put them both together and we have alkaline water—a drink containing both vital elements. Alkaline water typically has a pH level of about 8 or 9. It also contains several key minerals such as calcium, potassium, sodium and magnesium. Drinking this type of water is one of the best things you can do for your health. In fact, you can increase your pH by drinking alkaline water more than any other habit—even adopting a raw vegan diet! Water sold as “alkaline water” is available at most grocery stores. 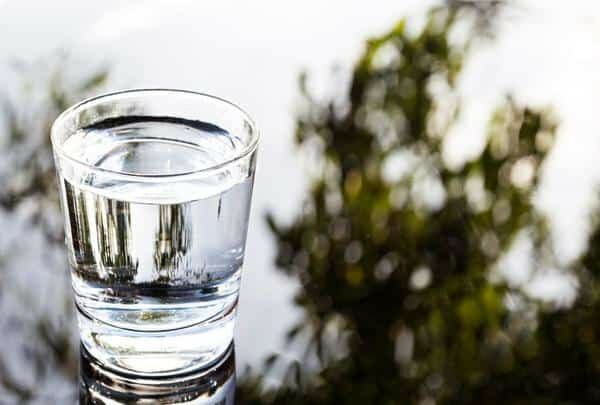 Besides being inconvenient and expensive, there are several issues with bottled water alkalinity claims that don’t (ahem) hold water–their pH claims are often wildly wrong, because if they are creating alkalized water through ionization, this process doesn’t permanently change the nature of the water–it reverts back within a few hours. Or if they are claiming alkalinity through mineralization, they use synthetic “mineral” additives your body can’t use. 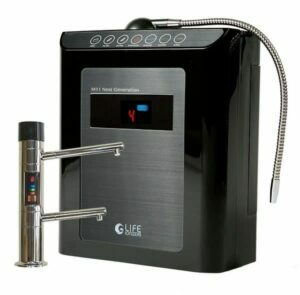 The Life Ionizer water ionization system that I have in my own home. Another common name for alkaline water is ionized water. The best and most efficient way to get alkaline water is with the use of a water ionizer at home. Not only can you set the pH to a perfect 9.5, the ionization process also creates antioxidants. Before I bought mine a few years ago, I spent several months researching the many water ionizers and testing the pH level of the water–not just when the water came out of the ionizer, but several hours later, as well. Ultimately, I chose the Life Ionizer water ionization system for my own home. And a wonderful side-benefit to increased health? Weight loss. How Does Alkaline Water Help with Weight Loss? Diminishes fat cells. Maintaining an alkaline, hydrated environment reduces the body’s need to create more fat cells in which to store excess acid. This benefit results from alkaline water’s ability to detoxify, explained next. Detoxifies. The accumulation of acid wastes around cells creates a toxic condition called acidosis. In an attempt to control this toxic environment, the body creates fat cells whose mission is to contain the acid waste and keep it away from the body’s organs. Creating an alkaline environment reduces these toxins,and as a side benefit, reduces fat and helps one reach a natural and healthy weight. Breakdown of fats. Your body converts fat to energy by a process called lipolysis. This process depends on a chemical reaction called hydrolysis—the chemical breakdown of a compound due to its reaction with water. In order for this system to work, proper hydration is essential. When water is ionized, the size and shape of the water molecules change– they become smaller. Their reduced size makes it easier for them to pass through the cell walls and enable them to hydrate parts of the body that have long been dehydrated. It’s an amazing, energized feeling you get, when you start drinking this type of water and your body becomes saturated in antioxidant-rich alkaline water! Neutralizes lactic acid. Alkaline water neutralizes the lactic acid waste that your muscles produce when you work out, helping you exercise longer and avoid sore muscles. Increases your metabolism. When you are dehydrated, your body slows down your metabolism in order to conserve water. Resets leptin levels. Leptin is your “stop eating” hormone. It sends a “full” signal to the brain that keeps you from that second helping of your favorite pasta carbonara. Eliminating toxins, creating an alkaline environment, and lowering inflammation all help to reset your leptin levels, allowing for effortless weight loss. Their conclusion? Hydrogen-rich alkaline water represents a potentially therapeutic and preventive strategy for metabolic syndrome. The Okinawa Centenarian Project was a study conducted to determine why Okinawa—a Japanese Island—had more people living to the age of 100 or older than anywhere else on earth. They found that their diet is rich in vegetables and fruits, they exercise daily, practiced mindfulness, and drink an alkaline water rich in healthy minerals. While you may think alkaline water is out of your financial reach, keep in mind, it is pennies on the dollar compared to buying bottled alkaline water, which, as we’ve explained, usually doesn’t stay alkaline after it’s bottled and until you drink it anyway..
Another remarkable difference is that reverse osmosis and distilled water units remove all the minerals and create a very acidic water–usually somewhere between 4.5 and 5.7. The bottom line is that adding alkaline water to your diet and daily lifestyle is an excellent and easy way to increase your health and provide your body with the hydration and minerals it requires to help you maintain your ideal body weight. 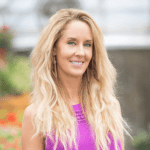 I did a webinar with an alkaline water expert here, for you to learn more about how alkaline water may serve your health goals, and how to get a system installed under your own sink at wholesale price. Voss, Gretchen. When you lose weight—and gain it all back. NBC News. 06/2010. Ericson, John. 75% of Americans May Suffer From Chronic Dehydration, According to Doctors. Medical Daily. 07/2013. Vorobjeva, N.V. Selective stimulation of the growth of anaerobic microflora in the human intestinal tract by electrolyzed reducing water. Elsevier Medical Hypothesis. ScienceDirect. 2005. The Ultimate Alkaline Water Cleanse. Life Ionizers. 2015. This is very informative! I’m trying to lose weight these days as I tend to sit all day working and I was also suggested to try alkaline water at the same time probiotics. I’m currently taking probiotic supplement regularly and now will consider alkaline water with it. Thanks!